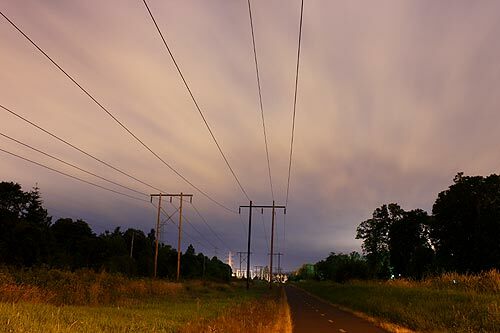 (Portland, Oregon) - While summer may be hiding its pretty little head from Portlanders at times this week during the daytime, it has made for some striking visual effects at night. 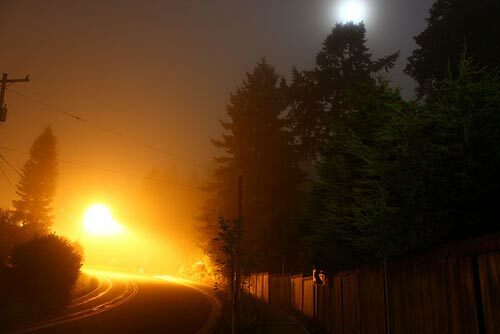 From a freaky July fog in the wee hours, city lights reflected on cloud cover to unusual lighting from the moon, summer sometimes waits until the sun goes down to wow you. It all started last week, as funky clouds started raining on Portland’s summer parade – at least figuratively. They actually didn’t start the waterworks until the weekend. 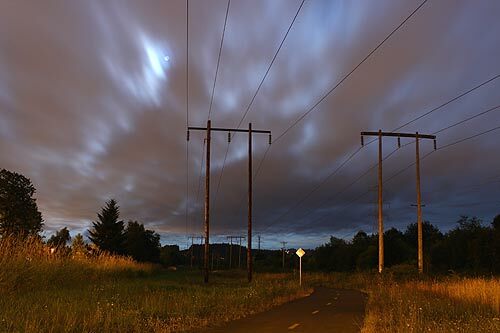 The Beaverton Creek Wetlands Trail (both photos above) late in the week: the city casts a strange glow on the clouds above, giving everything an orange tint at times. The purple is caused by the bright moon – nearly full – lighting up the sky and making it nearly blue, which when forced through the clouds makes them a bit purple. 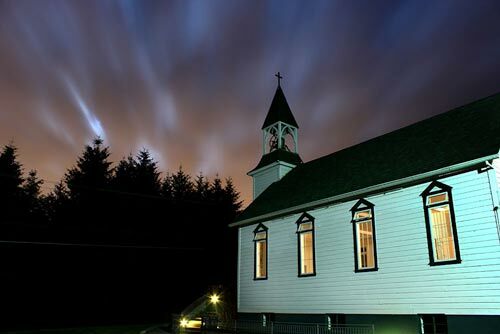 Near Beaverton, up around NW Cornell Road and Germantown Road, the Bethany Bible Church gets an especially interesting treatment from the clouds, the moon and the city’s glow. The church dates back to around 1895, created by Swiss and Russian immigrants in that area between Hillsboro and Portland. One of its architectural highlights is the stone steps, which give it more of a historic vibe – yet these were added only in recent decades. 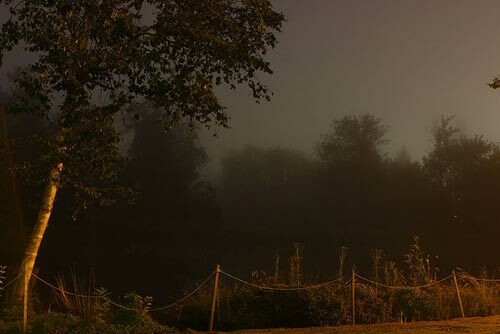 On another night in the late part of the week showed Creston Park, off Powell Boulevard in SE Portland, looking more than a little enchanted in the middle of the night. 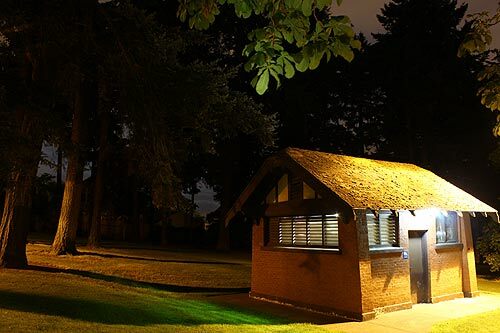 The lowly restrooms manage to look like something out of a fairly tale in the midst of this forested urban space. 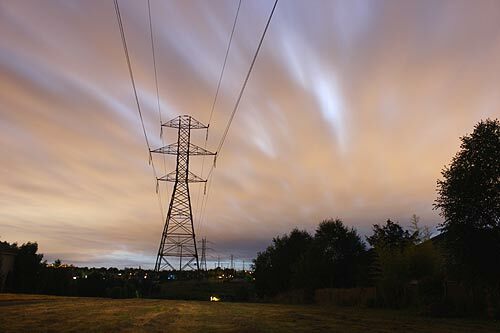 Then, on Sunday, as rain soaked the Portland area with a record-breaking .67 inches, thus breaking a lot of hearts when it came to summer, it also had a hand in a major power outage in the Beaverton area for a few hours. The outage shut down at least two restaurants in the area for the day: Canyon Grille and Emelie’s Bakery. But it had some interesting side effect later in the day. Although no rain was present, the moisture in the air created some wild fog late at night on Sunday. This, coupled with a near full moon, helped create some amazing moments in the wee hours of the night in the West Slope area. On SW 87th, near Canyon Road, it was exceptionally engaging. Though it looked more like October, it definitely had a July humidity. In SW Portland, SW 87th was thick with the ethereal stuff, including a hidden pond just off the road. 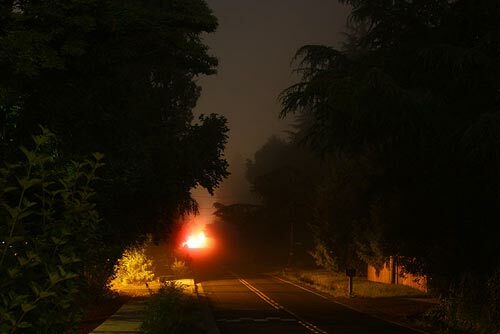 All over the area this unusual summer fog made for stunning sights, as street lamps, the moon and hints of stars poking through acquired an ethereal fuzziness. It was all proof that every cloud – including ones that bring fog – have some sort of silver lining, at least visually.